Help forums. Despite the fact that their function is almost completely redundant to anyone with the ability to use Google properly, they continue to buck the general trend of forum decline and remain active despite the rise of modern social media sites. Help forums answer questions. Your questions. Or rather, their members answer your questions – often regardless of whether or not they know the answers. If they don’t know the answer, they may guess, prefixing their reply with the immortal “I’m pretty sure…”, or alternatively they may answer a question to which they DO know the answer, but which is completely different from the one you asked. Responses range from cut and paste chunks of text from Wikipedia, through wild speculation or long-winded and entirely unnecessary interrogations from members who “can’t answer without more information”, to out and out, bitter attacks on the inquisitor, who is told to come back and “ask properly”. And somewhere amid this chaos, there are some answers that actually do tell the inquisitor what he or she needed to know. But statistically, posting a question on a help forum is far more likely NOT to get you the information you need than to provide the answer you’re really looking for. The type of answer you’ll get depends on who’s around. You may be lucky enough to get an expert, but unless there’s a very good reason for them to be working for free on forums, the real experts will be putting their knowledge to commercial use and earning money from it. So who are these mysterious characters who answer questions on help forums, without pay, and often without as much as a thank you from the people they help? And more intriguingly, why the hell do they bother? If you knew everything about IT, why would you spend your time working for no pay and no significant thanks on behalf of some random character who set up a forum, as opposed to doing exactly the same thing for money? Some forum helpers help virtually no one. They’re not there to help. They’re there to pick nits out of people’s questions and try to make fools of them. In other words, they’re trolls. Answering questions on a help forum is actually a really easy way to troll, and one of the best ways to do it. Trolls traditionally suffer from an inability to get attention, but on a help forum, inquisitors pay undivided attention, because they have a problem and want a solution, and that generates some of the most focused attention you can find. Because those who bring their problems to the forum are so often inhibited by the fear of upsetting the one person they think can help them, they frequently allow themselves to be mildly tortured by the troll. Not only does this make the troll’s life easy – it also means he or she gets away with his/her behaviour on the basis that very few people complain. Some individuals crave control, and becoming a help forum helper is a way of getting it. When people want something, they’ll typically accede to moderate demands and tolerate being messed about a little. So by setting up as someone who can potentially provide what people with problems need, a help forum helper can exercise a fair degree of control. The control doesn’t last long, because tolerance is not indefinite and a help forum is hardly the final frontier, but it doesn’t need to last long, because there are always new inquisitors. When one control fix ends, the next one is ready to begin. The form the control takes is usually a calculated inversion of the direction of questioning. Rather than being given a straight answer, the original inquisitor is interrogated by the power-tripper, and instead of getting information, he or she is coerced into providing it, post after post. "Why do you need to know that? ", "What equipment are you using? ", "Why are you using that equipment? ", etc... Most if not all of the interrogation is totally unnecessary, and the original help-seeker typically gets fed up and disappears after responding to three or four questions and getting nowhere. If the help-seeker dares suggest that the interrogation is unnecessary, he or she is branded as ungrateful or as a troll by the power-tripper, and often hounded by other regular forum users who are friends with the power-tripper. Once a control freak is accepted within a help forum community, he or she can be extremely hard to disarm. This is a slightly more general variant of the above. But it is different, because the attention may not necessarily be sought for ulterior purposes. The attention-seeker may want nothing more than approval, and helping lots of people is a route to approval. However, in the online world, gratitude is rarely expressed as fully or as regularly as it is in the offline world, and many of those who get help from help forums simply disappear and make no further response once they’ve got what they want. This, over time, can create a bitterness in approval-seeking forum helpers, and that can result in a churlish attitude from long-time exponents. This area is heavily afflicted with helpers who know next to nothing and do little more than waste everyone’s time. Forum status victims are users who typically joined the forum on the other side of the fence. They needed information and came in search of it. But after joining and starting to engage with the community, they began to notice that each forum member had a status. A certain number of reputation points, or a special achievement badge, or a fancy user title or whatever. In comparison, their own status appeared low, bordering on embarrassing, so they set about increasing it. 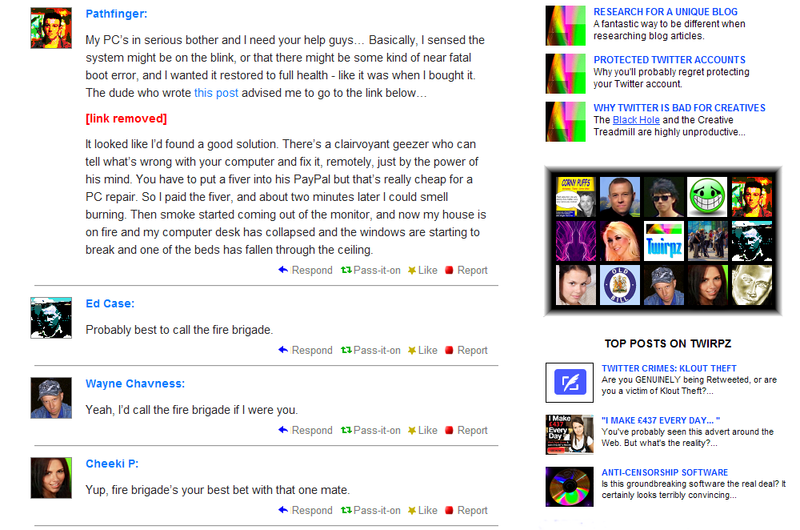 The way to do that was to be useful to the forum, so they began offering free help to other users. Soon enough, it stopped being just a one time fix for a low forum status, and became a competition. A game. A quest to beat other forum helpers. They were duped by a meaningless system of valueless forum ‘rewards’ or ‘badges’, into working for the site for free. Forum status victims can be very helpful and knowledgeable, but no one wants to look like an underling, so these systems can also prompt a lot of novices to attempt to provide information they don’t have. Commonly, forum status motivation can prompt a 'run and fetch' service which sees 'helpers' Googling the questions then copying and pasting to the forum the answers they think are right. Irrelevant answers are rife. Not necessarily because the 'helper' doesn't understand the question, but because Google's nearest match is not near enough. That said, however, there is an impetus here for even novices to learn and get their responses right, as providing useless or irrelevant answers tends not to get them the status they’re looking for. If human beings have three innate needs in life, they are: to eat, to sleep, and to show off. The above category edges towards this one in that status is typically at the centre of a show-off's arsenal. But knowledge, in itself, can look impressive too, and people who have plenty of it, or at least think they do, will sometimes want to yell the fact from the rooftops. Helping people on a help forum can be a good way to demonstrate a wealth of knowledge to a wide audience. Show-offs on help forums can provide useful answers, but their need to demonstrate how much they know often results in unnecessarily convoluted replies. The fact that their need to look clever ranks way above their desire to actually help people can also mean they provide irrelevant information, and answer questions other than the ones people have asked. The most reliable source of good help forum help comes from the promoters. A high proportion of these users do actually know something and are ready to pass on their knowledge for free. Why do they do it? Because they’re able to integrate promotion into their answers. They may want to promote a website, or a business, or even a product. Forums will rarely tolerate unmitigated promotion of personal interests. They regard it as spam. But they will often make exceptions for people who are providing a genuine free service for the forum. Commonly, forum helpers will insert a link to their personal interest into their signature, and perhaps allude to it subtly in their interactions. As long as it doesn’t come across as spammy or conflict with the forum’s interests, and the forum is gaining something from the user’s expertise, the promotion is allowed and there’s a mutual benefit. Finally, there are those whose motivations combine two or more of the above. It can get pretty complicated, but what you should always keep in mind is that no one – NO ONE – ever does anything without there being something in it for them. And most of what’s in it for helpers posting for free on forums is limited at best. That doesn’t mean you’re not going to get a useful answer from a help forum, but it does mean you’re more likely than not to have to jump through hoops to get it, and it's highly unlikely you'll get your desired info in a single post, or within 24 hours. It will usually be much eaiser and less hassle to source the information through a good search engine. If you learn to use Google’s Advanced Search, you’ll virtually never need help forums, because most answers to most questions are already on the Web. But there's still a big market for help forums. While people want, and think they can get, instant solutions at no cost or effort on their own part, and until someone comes up with a more enticing free option, the help forum, despite its sometimes 'worse-than-doing-nothing' nature, will continue.